Inspire your child's awareness of nature with Camp BioPark. Camp BioPark is for children, preK - grade 9. Learn science through hands-on activities, games and art. Join us to explore the fascinating world of plants and animals! Summer camps run June 3-July 26, 2019. More information for individual camps coming soon. Registration begins Wednesday, March 6, 2019, at 8:30 a.m.
Camps for students in Grades 2 through 9 include at least one behind-the-scenes tour. From butterfly discovery to biology treks along the Rio Grande, Camp BioPark has curriculum for youth of various ages. Select camps based on the grade your child is entering in the upcoming school year. Campers can sign up for two different half-day classes, but parents are responsible for transportation between locations. Childcare is available during lunch if the two camps are at the same location. Online registration allows us to save thousands of pieces of paper and streamline the sign-up process! If you have problems, please call 505-848-7180. Registration begins Wednesday, March 6, 2019, at 8:30 a.m. Spaces are filled on a first-come,-first-serve basis. Register Online. 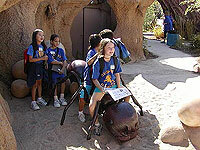 New Mexico Biopark Society members receive a 10 percent discount for camps. Please have your membership number handy when you register. Refunds given if requested at least two weeks prior to the start of the first day of class, minus a $25 processing fee per class/per child. No refunds will be given if requested within the two weeks prior to the first day of class or once classes begin. Camp BioPark for Preschoolers - Beginnings! Preschool Beginnings gives children ages 3-6 and accompanying adults the opportunity to encounter the amazing world of animals and plants at the BioPark. Classes meet once a week for this seven-week program. Choose one weekly adventure or join us for all three! Crawl with bugs, fly with butterflies, plant seeds, make butter! Pre-school children and one accompanying adult find out what makes the ABQ BioPark Botanic Garden tick. Every day a different area of the Botanic Garden will be highlighted with songs, activities, story, crafts, exploring and fun. Cost: $130 for all seven classes. Price includes one child and one adult. Additional children are $65 each for all seven classes. Explore the amazing world of animals and plants at the BioPark! Preschool children and one accompanying adult will play games, create fun works of art, sing songs and of course, visit the exhibits. Take a peek in the ocean, watch a butterfly drink from a daisy, explore wildlife native to our backyard, and discover animals from around the world. Cost: $130 for all seven classes. Price includes one child and one adult. Additional children are $65 per child for all seven classes. Choose to enroll in either the Wednesday or Thursday session. Camp BioPark for Grades K-1 - Discover! Discover camps are for children entering grades K-1. These camps allow children the opportunity to discover more about nature through hands-on activities, art, and tours of exhibits. Children will spend their mornings with our skilled early elementary educators. Discover camps are week-long camps, Monday-Friday, and are offered in the mornings from 8:30 a.m.-noon. Grab your safari gear and head down to the Zoo for new adventures! You’ll meet animals up close and tour the Zoo to learn about incredible critters from around the world. You’ll discover amazing animals from tiny frogs to enormous elephants and everything in between! Games, arts and crafts, and lots of fun and learning are all included in this half-day camp. From exploding seeds to model trains, amazing insects in the BUGarium, and farm animals at the Heritage Farm, there is much to be discovered in the Botanic Garden. Join the quest to see, smell, hear, touch, taste, and discover the wonders of nature in this half-day class. Participants will learn about plants and wildlife native to New Mexico and around the world, and get hands-on in the dirt to learn all about the earth. Is a jellyfish really a fish? Why are some fish so bright and beautiful? Campers will discover the secrets behind the fascinating lives of aquatic animals, and get up-close and personal with sharks, stingrays and invertebrates at our touchpools. Fish songs, crafts, games and exhibit exploration will make up this half-day camp to learn all about rivers and oceans and their amazing inhabitants. Camp BioPark for Grades 2-3 - Explore! Explore camps are for children entering grades 2-3. These camps encourage science exploration through hands-on experiments, keeper talks, and inquiry-based activities. Explore camps are half-day, week-long camps, Monday-Friday, offered both in the morning and afternoon. Explore all that bugs do for us, from pollinating plants that grow our food to decomposing our waste and so much more. Explore the Botanic Garden through a bug’s eyes this summer! Learn about the life cycles of butterflies and dragonflies, find out which bugs like bright colors and which bugs like rotten odors, and explore the different kinds of environments bugs call home in the BUGarium. This class is full of hands-on activities and games to help us understand the wild and weird world of bugs! Dates: Camps run Monday-Friday. June 3-7, June 10-14, June 24-28, July 8-12 or July 15-19. Have you ever investigated marine animals under a microscope? Or felt the skin and teeth of a shark? With hands-on activities, action-packed games, and behind the scenes tours, we’ll take a closer look at aquatic animals in this fun afternoon class. Along the way, we’ll discover the jobs these animals do, how Albuquerque is connected to the ocean, and why the health of the Rio Grande and oceans are so important to us all. Spend the week learning all about the amazing animals at the Zoo. Explore habitats from around the world and what animals need to survive. How does mucus help keep a hippo cool in the African savanna? How does a polar bear’s hair and skin help keep it warm in the Arctic? Uncover the amazing adaptations of animals around the world with activities, art, zookeeper talks and behind-the-scenes tours in this fun-filled and educational morning camp. Check out the world wide web of life in this half-day Zoo camp. From the Arctic to the Amazon, you’ll explore amazing habitats to find out which animals call each place “home.” What’s the connection between orangutans and candy? How does hippo dung support an entire ecosystem? What’s so important about frogs? Join us for hands-on activities, games, behind-the-scenes tours and more to explore the answers to these questions and more! You’ll also find out what you can do to help protect animals from around the world. Camp BioPark for Grades 4-6 - Adventure! Adventure camps are for children going into grades 4-6. These camps take participants on adventures throughout the BioPark facilities and include multiple behind-the-scenes tours and keeper talks on top of science activities, games and art to make summer learning fun! Adventure camps are full-day, week-long camps, Monday-Friday. Calling all animal lovers! Prepare to be amazed by the things you’ll learn about amphibians, reptiles, birds and mammals. In this camp, you’ll discover the wildest creatures on Earth and learn their secrets of survival. You’ll find out what it takes to care for exotic animals as you go behind the scenes with zookeepers, and you’ll even have the chance to prepare food for some of the Zoo’s animals. Games, hands-on activities and art projects complete this wild week of day-long adventures. Aquatic adventures await you as you unravel the mysteries of marine life and discover your connections to the ocean! Sink your teeth into the truth about sharks, meet a “living fossil,” and look down into the tanks from behind the scenes. You’ll learn about the most magnificent creatures found in water—from plankton to whales and everything in between! You’ll also discover why oceans and rivers are important to your everyday life. Hands-on activities, aquarist talks and art projects complete this week of day-long adventures. Get down and dirty at the most hands-on BioPark camp ever! At the Botanic Garden, you’ll come face-to-face with bizarre bugs, hunt for hidden symbols in the Japanese Garden, and meet the barnyard animals of the Heritage Farm. Every day will be full of action-packed planting; whether you’re learning about the secret lives of trees, making masterpieces inspired by nature, or growing a garden of your own to take home. If you like good, messy fun, you’re going to dig this camp! Activities include dirt exploration, keeper talks, art projects and more. Camp BioPark for Grades 7-9 - Investigate! Investigate camps are for children entering grades 7-9 who are interested in science careers and want to deepen their interests in nature. Participants meet with the expert staff and learn what it takes to care for BioPark animals, plants and habitats. Investigate camps are full-day, week-long camps, Monday-Friday. Ever want to be a zookeeper? Investigate how zookeepers care and interact with the exciting animals at the ABQ BioPark Zoo! Each week will focus on a different group of animals and will engage campers in a hands-on experience where they will create animal enrichment, research and observe animal interactions first hand, and submit their own exhibit designs. Discover the special techniques used by zookeepers and trainers to enhance and stimulate the lives of zoo animals. Learn from the experts in this fun camp that will teach you what it takes to work with these fascinating animals. Choose from three different camps – Pachyderms and Hoofstock, Carnivores, or Primates, Birds and Reptiles. Get hands-on and investigate how our actions matter with these camps at the ABQ BioPark Botanic Garden and Aquarium. Time to roll up your sleeves and get to work making a difference in this conservation-focused week. Campers will focus on stewardship by working on projects that help threatened species. Build native bee homes, plant native species to encourage the return of butterflies and remove invasive species at the ABQ BioPark Botanic Garden. Gain real world experience while giving back to our community and working with professionals in their fields. Investigate the relationship between waters and wildlife in this fun-filled camp. Inside the ABQ BioPark Aquarium, encounter animals as the river leads us to the sea. We will be focusing on river otters, sea turtles and sharks. Discover how you can help endangered species and spread the word about how our actions matter. Learn from aquarists and get behind the scenes tours. "My son is very inspired by the camp and loves learning about how a zoo works. He has built a zoo in our backyard with his plastic animals." "The experiences have led to lifelong memories and education that will remain with my daughter and she will gladly share with friends and her children. Thank you for your awesome work." "This was my child's first camp experience, and he absolutely loved it! We will definitely be returning for future camps." "My daughter loves this class! She has been full of information to share each day when she comes home. I love the security and safety and attention to each child. I know that she is safe and well cared for while learning at the Zoo." "We have tried many programs throughout the city, and this is the only one my son begs to attend year after year. He learns new information every time." "My daughter went to Camp BioPark this year. She LOVED it! I asked her favorite part and she replied, 'everything!'" "My 9-year-old son went to Camp BioPark this summer. He loved every day, and is already asking to go back next year. He wants to be a zookeeper when he grows up and this camp reinforced that dream. We came from Roswell to take him and it was worth the trip!"